Charles Bowers Momsen was born in Flushing, Long Island, New York, on 21 June 1896. He attended the U.S. Naval Academy, graduating with the Class of 1920 in June 1919. Following initial service in battleships, he was trained as a Submarine Officer and commanded three submarines in 1923-27. Following those commands, Momsen was assigned to the Bureau of Construction and Repair. In 1929-32 he was actively engaged in the development of a submarine escape breathing apparatus that came to be known as the Momsen Lung. During the remainder of the 1930s, he held positions in submarines and surface ships and was in charge of Navy Experimental Diving. In 1939, Commander Momsen was involved in the salvage of the sunken submarine USS Squalus (SS-192). During World War II, he led two Submarine Squadrons, including service at sea as a "Wolf Pack" commander, and held other important staff and training positions. Captain Momsen was commanding officer of the battleship USS South Dakota in December 1944 - July 1945.During 1945-51, Rear Admiral Momsen administered the Japanese merchant marine, was Commandant of the Naval Operating Base at Guam, served on the Navy's General Board and was Assistant Chief of Naval Operations for Undersea Warfare. In May 1951, he took command of the Submarine Force, Pacific Fleet, holding that position until June 1953, when he became Commandant of the First Naval District. He was Commander, Joint Task Force Seven from April 1954 until September 1955, when he retired with an increased rank on the basis of combat awards. Vice Admiral Charles B. Momsen died on 25 May 1967. 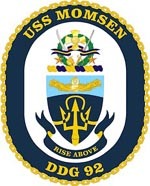 The Shield: Gold and Dark Blue represent the Navy; Celeste (Light Blue) and arched chief symbolize world-wide capability. The single nebula rompu represents the submarine rescue chamber developed and tested by Vice Admiral Momsen and since used by the Navy in submarine rescue operations. The upper portion of the nebula is freed and rising from the main body to convey the function of the rescue chamber and Momsen Lung, devices conceived and developed by VADM Momsen to save trapped mariners from damaged and sunken submarines. 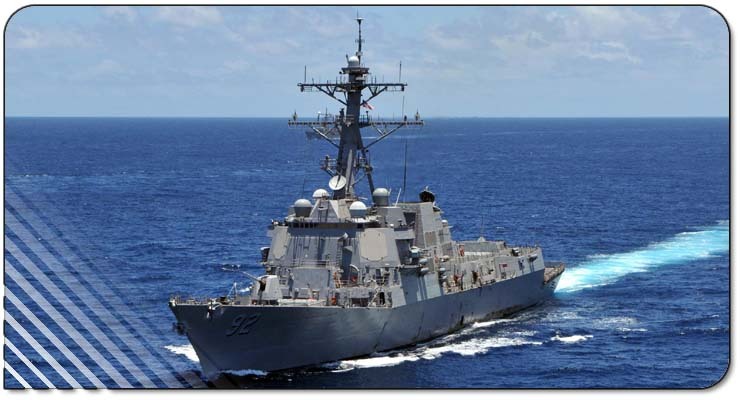 The demi-trident symbolizes advanced weaponry and sea-power and its tines recall the attack pattern employed by VADM Momsen against convoys of Japanese shipping during Word War II. The dolphins, derived from the submariners' badge, and traditional friends of the sailor, refer respectively to the diving community and the individual submariners whose safety was the main concern of the Vice Admiral's own diving skills and the equipment testing he conducted at grave personal risk. Gold denotes achievement and excellence. The Crest: The stylized Navy Cross refers to that awarded to VADM Momsen for his heroism as Commander of an attack group of submarines against Japan's forces in the East China Sea during World War II. The blue and gold riband recalls the Distinguished Service Medal he received among many awards for his wartime service; the two gold stars refer to the legion of Merit. The swords denote readiness and ability to fight the cutlass represents the enlisted sailor and submariner. Together, in the form of the letter "V", they represent the Vice Admiral's Combat Awards. The Wreath, symbol of honor and achievement, recalls the many and various decorations made to him during his distinguished career. The Scarlet doubling on the riband symbolizes courage and sacrifice and refers to Navy support to Marine Corps forces. Gold denotes excellence. Motto: "RISE ABOVE" Inscribed in gold letters on a dark blue forked scroll doubled gold.